I just love Love LOVE ramen egg!! 😀 It’s definitely one of my favorite ways to enjoy eggs. But if you have never tried a ramen egg, you seriously gotta try it now. Yes NOW! Ramen egg (味付け玉子 Ajitsuke Tamago) is a sweet and savory Japanese soft boiled egg. The luxurious soft-set yolk and smooth just-set white has soaked in the soy sauce and mirin to make one deliciously divine egg. You can normally find this specialty egg as a topping on a fresh bowl of ramen, but it’s a common Japanese side dish or snack too. Everyone prefers a different egg yolk consistency, check out our Perfect Pressure Cooker Eggs Guide and find your favorite yolk. Then, you can apply that cooking time to this recipe! Step 6: Lay a paper towel on top of the eggs and soak up some of the marinade. Vegetable Steamer – We’ve used the trivet that came with our Instant Pot Pressure Cooker. But for those who don’t use Instant Pot, this steam basket will work as well. Now it’s YOUR turn to take out your pressure cooker and cook some Ramen Egg (Japanese Soft Boiled Egg)! 3 easy steps & 5 mins prep to make this divine Japanese ramen egg. Sweet & savory perfect soft boiled egg with luxrious soft-set yolk and smooth just-set white. Place steam rack inside the pressure cooker. Add exactly 1 cup of running cold tap water into the pot. Then, place the eggs at the center. Close lid. Open lid and immediately place the eggs in a bowl of cold tap water for 30 seconds. Rinse the eggs under cold running water for 5 seconds. Then, pour out the water in the bowl and refill it with cold tap water and place the eggs back into the bowl for another 3 minutes. Carefully crack and remove the eggs shells. Mix all the marinade ingredients in a small bowl. Place all the eggs in the marinade. Lay a paper towel on top of the eggs and soak up some of the marinade (see picture in the article). Place the eggs in the fridge for at least 4 hours (preferably overnight). *For Jumbo (XL) Eggs: add an extra minute to the pressure cooking time. *The pressure cooking time is for eggs straight out of the refrigerator. Everyone prefers a different egg yolk consistency, check out our Perfect Pressure Cooker Soft, Medium, Hard Boiled Eggs eggsperiment and find your favorite yolk. Then, you can apply that cooking time to this recipe! Storage: the ramen eggs are good for 2 days in the fridge. Total cooking time for the recipe does not include the inactive time. how much time do you use for 14 eggs? We haven’t tried 14 eggs. I am guessing maybe 1.5 – 2 minutes. I used the recipe to cook the soft boiled egg. I experimented a couple of times and adjusted the timing based on my preference on the doneness. I can now have repeatable success. I usually cook a batch of 7 eggs, 3 minutes on low, and add 15 seconds before I do a QR. the egg yolk comes out really creamy. I use the “master stock” recipe instead of the sauce above to marinate the eggs. It is just a matter of convenience since I am also making braised beef shank. One of these days I will try the Japanese sauce. Master stock eggs are yummy as well! Why do you reduce the cook time with more eggs ? When cooking more eggs, the get up to pressure time will be longer and the eggs will be cooking during that time. Any & Jacky, I tried to make the ramen eggs twice in the 3qt. First with 6 eggs at 3 minutes low pressure, QR. And they came out perfectly hard boiled. I tried again with 5 eggs and at 2 minutes low pressure, QR. Still hard boiled eggs. Is it possible that the 3qt has a different pressure/temp than the 6qt which I assume that was what you used to test the eggs? At least I got almost a dozen eggs done for Easter. LOL. 5 minutes for me, the yolk was too runny. I think I will go for either the 8 or 9-minute mark next time. What are your thoughts about re-using the marinade? I would recommend trying 7 minutes first. The marinade will last for about 3 days in the fridge so yes, you can reuse them. You can substitute mirin with sake by adding a pinch of sugar to it. What kind of moron did you use? The mirin in my grocery store contains Corn Syrup. We usually use the Kikkoman brand of Mirin. It also contains corn syrup. Is there any easy way to peel the shells? I tried cooking it for 5min and another batch for 6min, but I’m not having much success in peeling the shell without breaking the egg. Soft boiled eggs are harder to peel. The easiest way I found is to peel it under cold running tap water. Will the egg taste the same as your recipe if I use Japanese Soy Sauce instead? 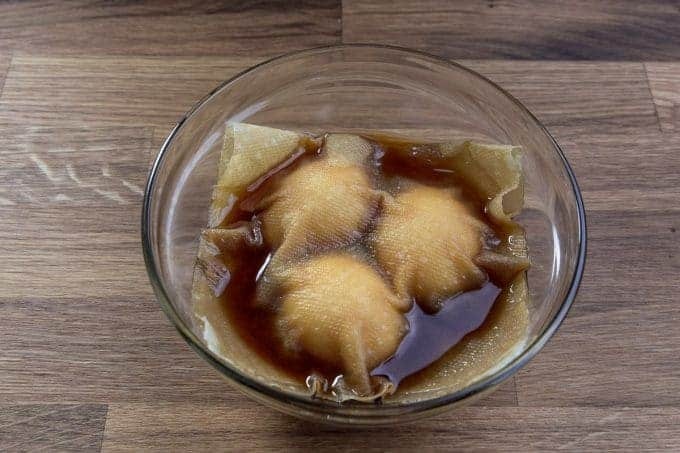 Japanese Soy sauce can be used instead for this recipe. 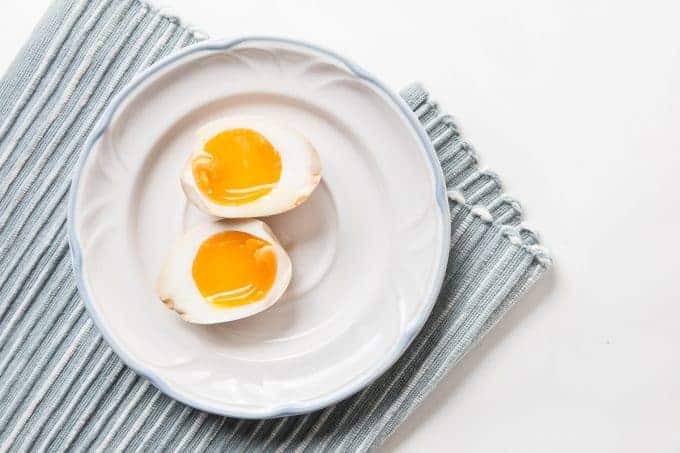 This may be a silly question, but do you just crack the egg shells and not peel them before putting them in the marinade? Or do you fully peel off the shell and then put them in the marinade? Thank you! It’s great to hear from you. Hope you have been doing well! It would be good to put this in the recipe. Thank you for this delicious dish. These were so easy to throw together! So yummy. Dare I say a comfort food? Thanks for sharing! I’ve never seen a recipe like this before- I can’t wait to give it a try and see how it turns out! I am so intrigued by these eggs. I can’t wait to try them. Thanks for sharing.